What Is An Oil Stain Remover? An oil stain remover is a product used to remove embedded grease and oil based stains from your stone without discoloring the surface of your stone. Another name for a stain removal product for stone is Poultice. 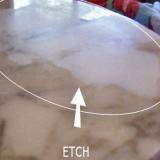 To remove greasy, oily stains from your stone! Butter sticks, drips, olive oil oversprays and greasy splatters? Or maybe your stone sucked up excess plumbers putter, a lotion spill, baby oil, coffee, hand soap or a leaky food containers grease? Doesn't matter if you're a new owner or old - using an oil stain remover is EASY! Use it on fresh stains and old! Use it on natural stones such as travertine, granite, marble, limestone, slate, quartzite and sandstone. You can even use it on masonry, concrete and cement based grout. Use it inside AND out! GREAT for countertops, floors, backsplashes and vanities. If you have an oil based stain, this is the stain remover you want. As soon as you notice dark spots, splotches or stains in your stone. Act quickly! The longer a stain sits, the harder it is to get out. Remember that a true stain is always darker than the stained material. A true stain is NEVER lighter than material that is supposedly stained. If the area in question is lighter than the rest of the stone it is either surface damage to the stone or your stone is doctored (dyed). Stain removal techniques will not work because neither surface damage nor doctoring is considered a stain. Apply it 1/4" THICK on top of the stain. Extend the paste an inch or two beyond the stain. Let the paste sit for 48 - 72 hours. It cracks... it dries... it scrapes off easily. Wipe off the dried paste. Let your stone sit for another day or two and dry completely. Stain Gone? Seal your stone! Stain Still Visible - even slightly? Repeat Above. Use plastic 'throw-away knifes' to spread and scrape off the paste. 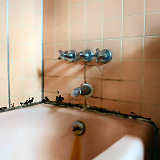 Use an old toothbrush & mineral spirits to clean crevises and grout lines. 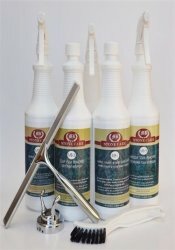 Use mineral spirits to clean your tools & your stone on completion. Be patient, let it work, and apply it again if you have to. Yes. The poultice sucked that liquid soap stain up and out! Picked up the liqid soap dispenser to see it had leaked! 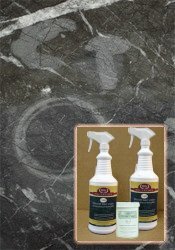 Cleaned the granite vanity top with this granite cleaner. Applied the oil stain remover overlapping the stain by an inch. Let the paste sit for 72 hours. Scraped up the dried putty with a plastic knife. Wiped the vanity top with mineral spirits. The stain disappeared after ONE application. There was no discoloration and no residue left behind. There was no evidence that a stain had ever been there! Worked when nothing else did! I was amazed that the stain was finally gone! This stuff is a lifesaver. Nothing I did would get the stain out. It 100% worked!!! Took an oil stain right out. No residue or shadow left....just clean granite. It worked on my coffee stains, which were pretty dark. Follow the directions.